There's no doubt about it: We like to nosh between meals. A 2010 Journal of Nutrition study found that almost a quarter of all the calories we eat comes from snacks. Oops! Of course, food companies are certainly familiar with this data. Fast-food joints advertise a "fourth meal." Snack-themed foods trying to capitalize on this trend as new and “innovative” products continue to come to the market. The munchies are real, people. But this isn't necessarily a good thing. We’ve all heard the arguments from the opposing camps: “Eat three squares a day.” “No, have five mini meals every two to three hours.” To snack or not to snack — which is it? When clients ask me if they should snack or if there is a magic number of meals and snacks they should be eating daily, I ask a bit more about what their day looks like. Clients often come to me with the same tendencies. They’re fueled by coffee in the morning, grab something fast and easy for lunch and then try to focus and work until dinner. Clearly, in this situation I’d recommend a snack. Our brains need fuel to focus, maximize energy and simply think. Nutrition expert Mike Roussell, Ph.D., agrees. “I almost always recommend a late-afternoon snack during that crucial time between lunch and dinner. This is a time during the day when energy levels lag and willpower is depleted — two things that can be helped by some calories. But that’s for energy and focus. What about snacking and weight loss? There has always been some discussion about meal frequency and weight loss. It was pushed in fitness magazines for years: Eat more frequently to stoke your metabolism and boost fat loss. Is it true? Does eating more frequently help control cravings and calories? Does meal frequency change weight loss? Theoretically, it makes perfect sense. When you eat, your metabolism increases to digest and use those calories, so eating more frequently should cause more frequent increases in metabolism. But does it pan out in the research? There are data in overweight teens and healthy, normal-weight adults showing that eating high-protein snacks can help curb appetite and prevent subsequent intake. The trouble is that most people don’t follow this strategy. “For most Americans, snacking isn’t helping them lose weight. 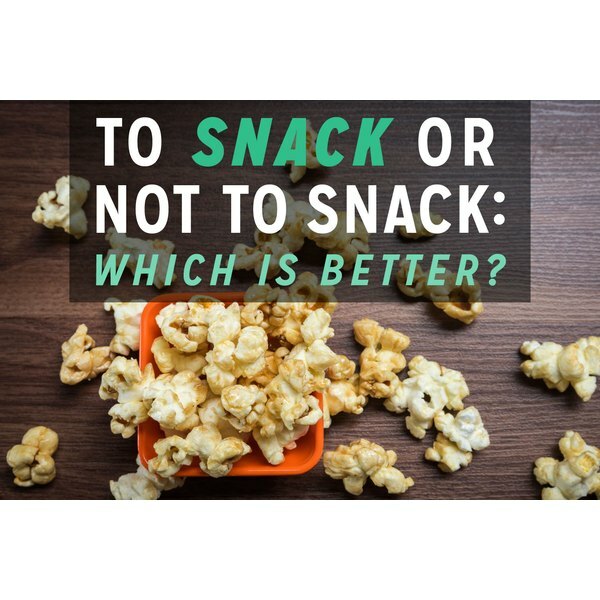 In general, the majority of snacks are 200 to 300 calories and are typically high in carbohydrates (sugars) and/or fats," notes Heather Leidy, Ph.D., assistant professor at the University of Missouri. These types of snacks don’t control the appetite and make you feel sated, so they don't prevent you eating again soon after. Another argument against snacking and weight loss is that each time you eat, you boost insulin levels (in response to the increase in glucose). Again, this comes back to the choices made. If your snack is high in sugar and low in fiber and protein, like a venti latte and a danish for example, that may be true. But when you aim for snacks within the parameters mentioned – about 250 calories and 20 to 25 grams of protein – skyrocketing insulin won't be an issue. That doesn't mean you always need to snack; it's just that when you do, aim to have them fall within those recommendations. The other question a lot of clients ask is about eating frequency and muscle. Do you need to constantly "feed the machine" to fuel your muscle? Looks again like all trails lead back to protein. When you eat protein, the amino acids needed to stimulate muscle growth peak after about two hours and then slowly decrease. Knowing that, if you're trying to build muscle, aiming for that same amount of protein — between 20 to 30 grams — would be of benefit. This isn't to say high-protein diets are the answer to your muscle needs, but this dose of protein should be a component of all meals and snacks as well. Another concern raised by some is the time of day they should stop eating. In other words, is a nighttime snack OK? One small study did in fact show nighttime snacking had a negative effect on fat burning and raised total and LDL cholesterol. However, this was just one very small study (so, in my mind, it’s nothing to hang your hat on). Back to the point I made earlier: It’s about what you eat more than when you eat. One challenge with nighttime snacking is the choices. Most people don’t sit down and start chopping spinach and grilling steak. They opt for the convenient, easy options like chips, ice cream, cookies, etc. Here are the five high-protein snacks that won’t erase your hard-earned accomplishments. This is a perfect snack to get you out of that energy slump. Since planning ahead is so important, this can be prepared the night before using frozen berries, which will defrost overnight. Combine frozen berries, cottage cheese and fresh mint, which is optional but adds a unique flavor. And at 14 grams of protein for just half a cup, this high-protein snack will help with satiety. This convenient high-protein snack works great for travel, at the office or simply to keep in the glove compartment of your car for when you or your family are pressed for time and all going in different directions. A portion the size of an iPhone offers about seven grams of protein. Doubling that amount and adding a piece of fruit gives your body what it needs. In fact, one study even found beef jerky to be a viable snack as a post-workout recovery food. Eggs are usually thought of as breakfast food, but hard boiling six or so on a Sunday makes for a perfect morning or afternoon protein nibble for adults and kids alike. At seven grams of protein per each whole egg, eating two is an easy way to get a little protein boost to stave off hunger. Nuts are one of the easiest, portable snacks around, hitting you with a dose of healthy fats along with protein. With the most nuts per serving compared to other snack nuts, combined with being a good source of protein and fiber, pistachios are atop the list of smart snacks to eat mindfully. They also have a shell, which slows down your snacking pace. One cup of this Asian-influenced snack packs in the same amount of protein as four ounces of chicken. Most stores have fresh varieties, but frozen edamame is a perfect option to keep in your freezer and quickly fuel your body. Of course, there isn’t a one-size-fits-all approach when it comes to snacking. Whether you should snack or not depends on your goals: Are you active, an athlete, going for glycemic control or focused more on body weight than performance? Snacking can help with focus and energy levels. And if it’s done with purpose and contains protein (ideally some fiber too), you’re creating a combination to fuel your body and keep you satisfied. Christopher R. Mohr, PhD, RD is a nutrition consultant, writer and speaks all around the world on the topic of nutrition, health and performance. He has a PhD in exercise physiology and is a registered dietitian. Are You Doing Protein Right? How Much Protein Should a Woman Have Who Is Lifting Weights?